Same as it Ever Was is a unique and totally different film experience. It will take you on a modern journey in ancient India, and on a journey to your own inner spaces. It is a mirror reflecting the need for a more spiritual/humanistic attitude to life. This is a musical film of rare beauty and serenity, with no plot and no dialogue. Floating downstream you are transported through the tranquil waterways of Kashmir to an age old gathering of India’s Saddhus (spiritual seekers) on the banks of the Ganges River. Hundreds of thousands of Saddhus, along with millions of pilgrims, travel from all over India to participate in this spiritual gathering called THE KUMBHA MELA. While our sophisticated modern world is constantly confronted with images of horror, fear and futility, the holy men of India seek enlightenment and immortality. Same as it Ever Was is a timeless film about a timeless land. It will appeal to audiences interested in India and particularly those interested in the music of Talking Heads and the classical ambient compositions of Brian Eno and Harold Budd. This DVD is in two parts. 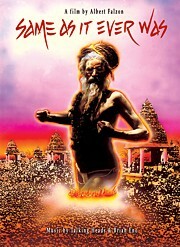 The first film features the great KUMBHA MELA festival with Talking Heads music from their classic album Remain in Light.